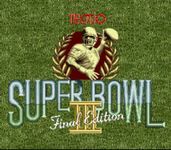 Tecmo Super Bowl III is the final Tecmo football game released on the Super Nintendo Entertainment System and the Sega Genesis. The game is closer to the real-life sport in comparison to its NES predecessors in several ways. It included some of the more nuanced strategies of football, such as attempting two-point conversions. Also setting itself apart from the NES-era games was the in-game presentation, which is more akin to the realistic "TV style" presentation of modern football games like the Madden series. After a big offensive play, or a turnover or sack on defense, a box would appear on screen with a small grayscale picture of the player involved alongside his current statistics for the game. The series' shift towards greater realism is also reflected in the game's season mode. First, it records fairly detailed statistics of each game and cumulative statistics for each team in the league throughout the season. Also throughout the season the game would maintain a list of leaders across the league in each major statistical category, and would record when a player or team broke an NFL record." Source: Wikipedia, "Tecmo_Super_Bowl_III:_Final_Edition," available under the CC-BY-SA License.